The Channel Islands are a set of low-lying islands off the southern California coast. There are seven major islands: San Miguel, Santa Rosa, Santa Cruz, Santa Barbara, San Nicolas, Santa Catalina, and San Clemente. A small set of islets, some connected at low tide, lying just east of Santa Cruz Island are called Anacapa Island. Anacapa, plus San Miguel, Santa Rosa, Santa Cruz, and Santa Barbara, are part of Channel Islands National Park. Santa Catalina Island is the only one that is populated; the town of Avalon is a popular resort. The islands are divided politically. Most of the northern tier (San Miguel, Santa Rosa, Santa Cruz) and Santa Barbara Island are assigned to Santa Barbara Co.; Anacapa and San Nicolas are assigned to Ventura County; and Santa Catalina and San Clemente are administered by Los Angeles County. These political jurisdictions complicate pelagic limits used offshore by local birders. Some of the islands have been heavily denuded by introduced grazers but efforts at recovery are underway. The islands have a heavy degree of endemism in plants and birds, but much of the habitat of the larger islands recalls the southern California foothills of brush and oaks. Unique Coreopsis 'trees' dot isolated (and otherwise tree-less) Santa Barbara Island. 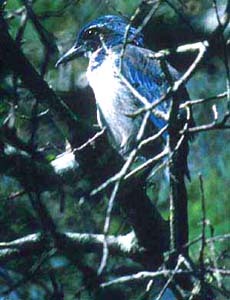 The Island Scrub-Jay is restricted to Santa Cruz Island, and there are 15-18 endemic subspecies on the Channel Islands (depending on your taxonomy). Like the Farallones, their offshore location produces wayward vagrants in spring and fall migration. California's only Stonechat was on Santa Clemente I. from 20-21 Oct 1995. They also serve as important seabird colonies (half of the world's Ashy Storm-Petrels breed here, as do many of the world's Xantus's Murrelets). Birding statistics and links related to the Channel Islands are on Joe Morlan's site but are divided between the various counties to which each island is assigned; you'll have to search out those counties and click on each one. An avifauna of San Clemente I. was recently published: Sullivan & Kershner, 2005, West. Birds 36: 158-273. 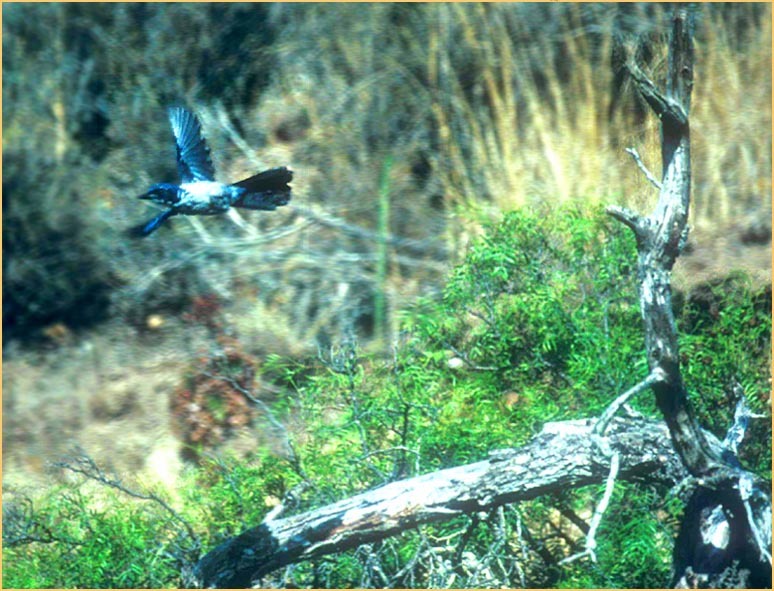 For the Channel Islands I feature its only endemic species: Island Scrub-Jay. The flight shot above shows the blue undertail coverts — a useful but not diagnostic character — and the closer photo (below left) gives a feeling of its long, heavy bill. 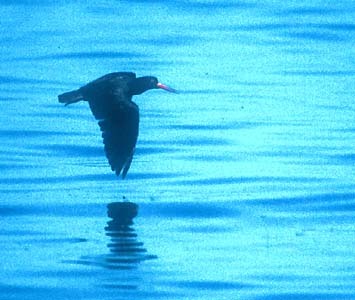 I've only been on the Channel Islands with a long lens one day, so the flight shot of Black Oystercatcher is also from Santa Cruz I. on 17 Aug 1992. My only other visits to date have been a special birding trip to Santa Barbara Island on 20 Sep 1974 — we found a variety of vagrants and some habitat shots are below — and a few boat trips that have circled Anacapa I. or San Clemente I. 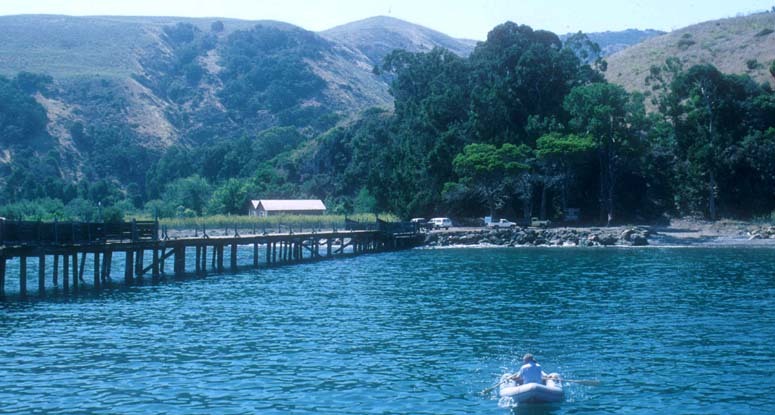 The upper photo (below) shows Santa Cruz Island and the landing dock there. Note how much the hills resemble southern California foothills (17 Aug 1992). The bottom two photos (below) show Santa Barbara Island, a very different place. It has a rugged shoreline and then is treeless ashore. 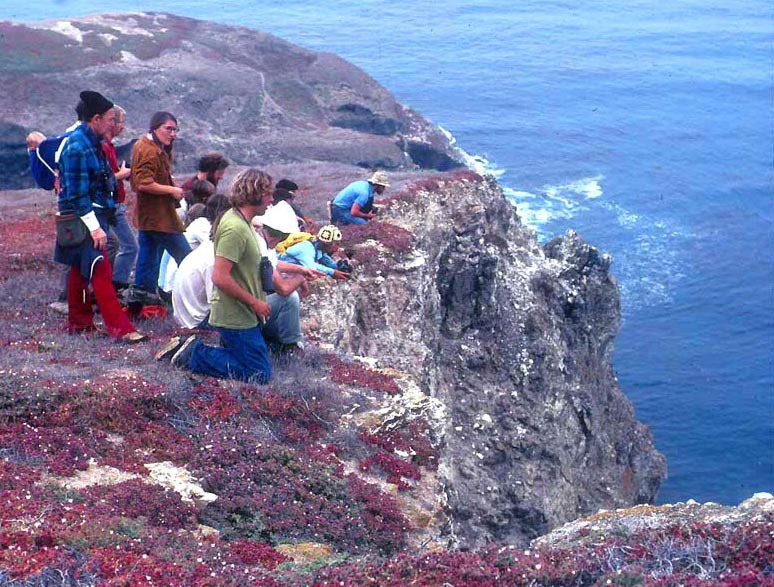 In the bottom shot, a group of birders (including Jon Dunn & Lee Jones) peering over a cliff edge in search of vagrants (both shots 20 Sep 1974).